Christopher ”Tiki Chris” Pinto is the author of two paranormal mystery novels and cheif writer of the Tiki Lounge Talk Blounge (web lounge). Mickey Spillane was the genious author behind the Mike Hammer series of noir-style gumshoe detective novels, as well as several other less popular but just as brilliant works. Most people today don't realize it, but in his day Mickey Spillane is arguably the most influential fiction writer in modern times. His first book, I, The Jury, sold 10,000 copies in hardback...but a record-shattering 2 million copies in paperback. It was this novel that turned the paperback market from an insignificant sideline to the mainstream book format choice for publishers and consumers. Spillane's Mike Hammer series struck such a chord with American readers that within a few years, the written series was made into several movies, a comic book and three television series. 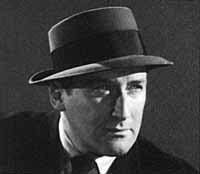 Continuing with his popularity throughout his life, Mickey Spillane became the all-time bestselling mystery writer of the 20th century. Spillane went on to star in movies and TV commercials, consult and write for the Mike Hammer TV series, and develop the Mike Danger comic. I read my first Mike Hammer novel, I, The Jury, when I was 13. I was instantly hooked. Since this was the pre-internet era, I searched every used bookstore and thriftshop for more of Spillane's writing, It took me years, but I managed to find and read every Hammer novel Spillane had written, and was lucky enough to catch every episode of the 1980s Mike Hammer TV series featuring Stacey Keach as the tough-guy detective. Hammer books were so different, so brutal compared to other books I had read that they stuck with me when I began developing my own writing style. My first attempt at a full-length story, SwingTime (1986) incorporated some tough-guy Hammer-style characters. When I began StarDust Productions Mystery Theater in 1989, I drew on Spillane's style for gangsters and detectives, and set most of my stories in Hammer era. Later, when I dove into novel writing, a hard-as-nails detective named Bill Riggins emerged, highly influenced by (but not exactly like) Mike Hammer. Spillane's novels impacted millions of people in all kinds of ways. For a few of us, his writing hit home and hit hard enough to give us the inspiration we need to put our own stories down in ink, and give us a hell of a high standard by which to be measured. I'm proud that my work has been held to that standard by many fans, and has held up. Thanks, Mickey, for everything.